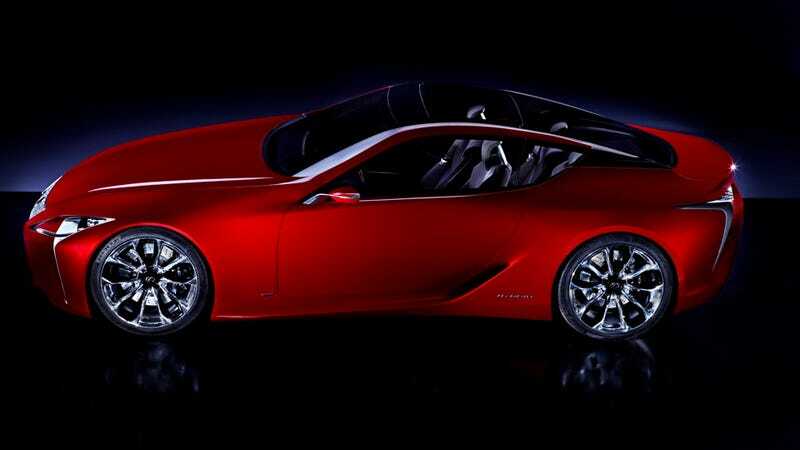 We got our first leaked look at the Lexus LF-LC concept car by way of Road & Track's gun-jumping. Now Lexus is in on the act, dropping their own photo of the brand's beige-busting show car. Lexus says the LF-LC, a 2+2 sport coupe, is a "clean sheet" design from company's Calty design studio in Newport Beach, Calif. Anyone with functioning eyes can spot references to the Lexus LFA's controversial styling. Naturally, the concept is a hybrid of some sort. I like it. It's risky and forward-reaching, but not grasping at relevance by being too self-consciously "organic." The last thing the world needs is a sports car that looks like something sprawled across the fish case at Whole Foods. Can't wait to see the rest of it in Detroit.